Vieux Oak Tree. Unique all in one format. Printed on 100% recycled paper. Featured in black. Custom color(s) welcome. I loved my wedding invitations! They were beautiful and more environmentally responsible than anything else I have seen available. Customizing our design and working with the design team was fun and easy. I would definitely use Forever Fiances again. I loved my send and seal invites! They were reasonably priced and the customization for our two wedding events was perfect! 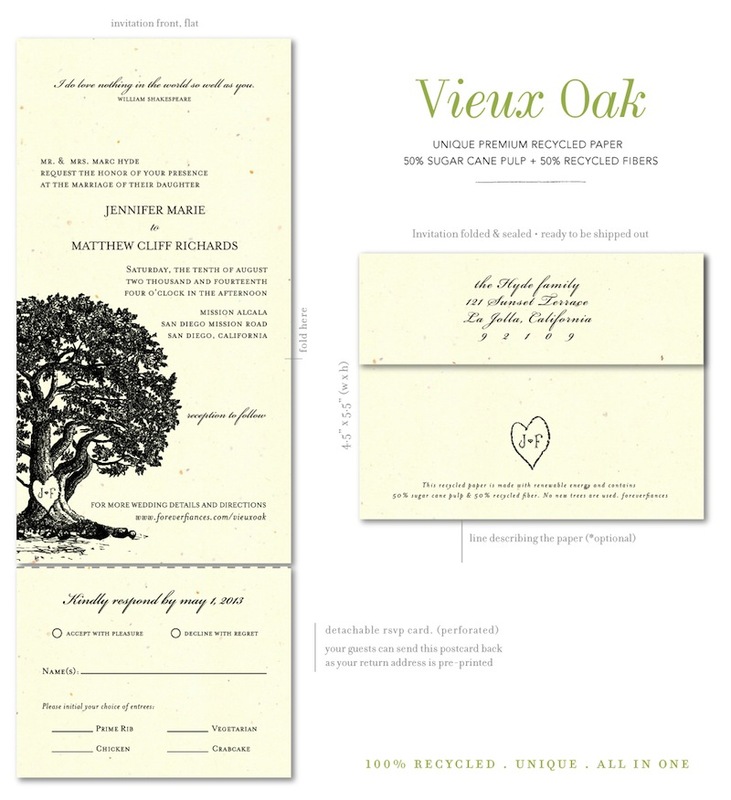 We were so happy to find ForeverFiance's and their sustainable invitations. They make beautiful, unique, plantable invitations, and also use recycled paper. Their commitment to sustainability is absolutely wonderful. The process of creating our invitations, from receiving samples, creating proofs, and placing our final order, was easy and convenient. They were very professional and responsive. Our invitations arrived yesterday and they are beautiful. We would definitely recommend them. I loved being able to customize the colors and wording! The proofs were a huge help to make sure that everything looked the way I wanted! And being able to have the addresses printed at a reasonable rate saved time and looks beautiful! Everyone has been telling us how pretty and unique they are :) thanks so much!! What a tree! Whimsical and so us. We got married in an old mansion with a super old oak tree, so this invite was just the most perfect choice. Can't wait to order the thank you notes!